Here are some snazzy birthday facts about 18th of September 1961 that no one tells you about. Don’t wait a minute longer and jump in using the content links below. Average read time of 10 minutes. Enjoy! What day was my birthday Sep 18, 1961? September 18, 1961 was a Monday and it was the 261st day of the year 1961. It was the 38th Monday of that year. The next time you can reuse your old 1961 calendar will be in 2023. Both calendars will be exactly the same! This is assuming you are not interested in the dates for Easter and other irregular holidays that are based on a lunisolar calendar. Fun stat: Your first one billion seconds (1,000,000,000) happened sometime on May 27, 1993. If a dog named Prentiss - a Leonberger breed, was born on the same date as you then it will be 310 dog years old today. A dog’s first human year is equal to 15 dog years. Dogs age differently depending on breed and size. When you reach the age of 6 Prentiss will be 45 dog years old. From that point forward a large-sized dog like Prentiss will age 5-6 dog years for every human year. George I, the first Hanoverian king, arrives in Great Britain after becoming king on August 1st. Tiffany and Co. (first named Tiffany & Young) is founded by Charles Lewis Tiffany and Teddy Young in New York City. The store is called a “stationery and fancy goods emporium”. The United States Air Force becomes an independent branch of the United States Armed Forces. The NAFC and CCCF merge into CONCACAF. U.N. Secretary-General Dag Hammarskjöld dies in a plane crash while attempting to negotiate peace in the war-torn Katanga region of the Democratic Republic of the Congo. Constantine II of Greece marries Danish princess Anne-Marie. Anti-Personnel Mine Ban Convention is adopted. First mailing of anthrax letters from Trenton, New Jersey in the 2001 anthrax attacks. What does my birthday September 18, 1961 mean? 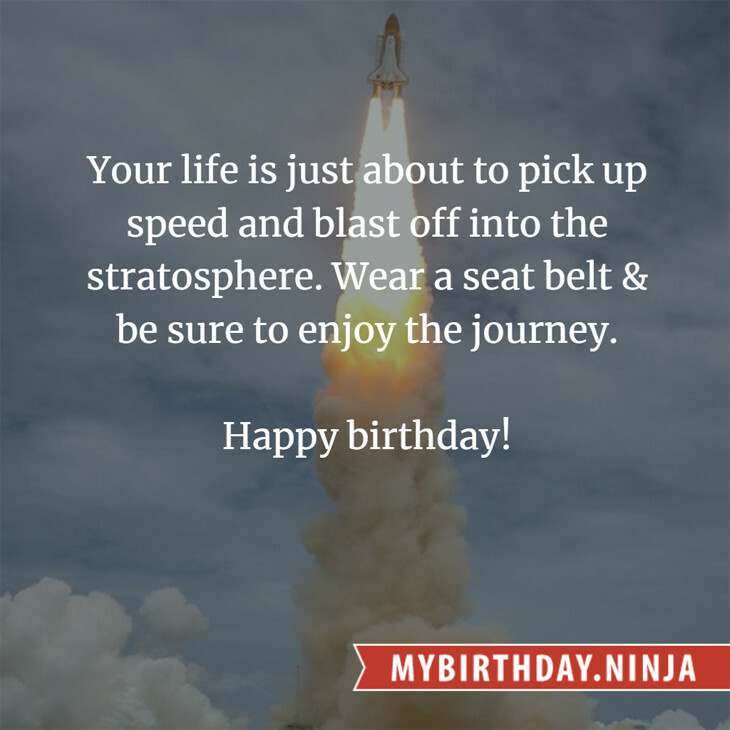 Your birthday numbers 9, 18, and 1961 reveal that your Life Path number is 8. It represents experience, authority and endeavour. You are gifted with natural leadership and the capacity to accumulate great wealth. The following celebrities also have the same life path number: Camila Bordonaba, Jennifer O'Neill, Landon Pigg, Chise Nakamura, Nadia Arslan, Peter Falk, Molly Ringwald, Lee Joon, Paul Bartel, Kay Panabaker. 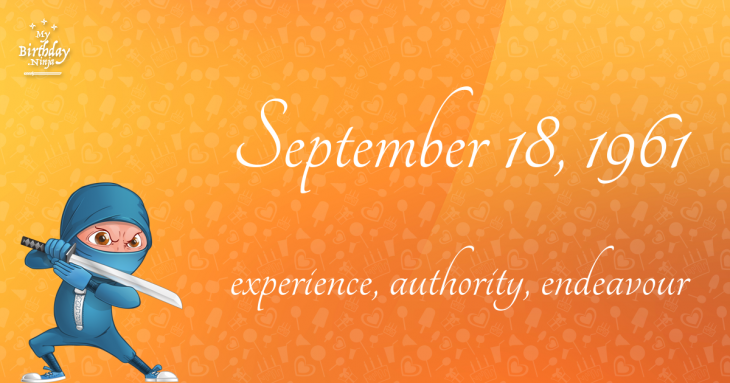 What is the birthday horoscope for Sep 18, 1961? The Western zodiac or sun sign of a person born on September 18 is Virgo ♍ (The Maiden) – a mutable sign with Earth as Western element. The ruling planet is Mercury – the planet of communication. According to the ancient art of Chinese astrology (or Eastern zodiac), Ox is the mythical animal and Metal is the Eastern element of a person born on September 18, 1961. Fun fact: The birth flower for 18th September 1961 is Aster for memory. What is the Love Match for Sep 18, 1961? When it comes to love and relationship, you are most compatible with a person born on June 15, 1988. You have a Love Match compatibility score of +147. Imagine being in love with your soul mate. On the negative side, you are most incompatible with a person born on April 13, 1934. Your incompatibility score is -173. You’ll be like a cat and a dog on a love-hate relationship. Arf-arf, I want to bite you. Meow-meow, stay away from me! The number-one hit song in the U.S. at the day of your birth was Take Good Care of My Baby by Bobby Vee as compiled by Billboard Hot 100 (September 18, 1961). Ask your parents if they know this popular song. How many babies were born on September 18, 1961? Base on the data published by the United Nations Population Division, an estimated 109,557,830 babies were born throughout the world in the year 1961. The estimated number of babies born on 18th September 1961 is 300,158. That’s equivalent to 208 babies every minute. Try to imagine if all of them are crying at the same time. What is the popular baby name on 18 Sep 1961? Here’s a quick list of all the fun birthday facts about September 18, 1961. Celebrities, famous birthdays, historical events, and past life were excluded. Try another birth date of someone you know or try the birthday of these celebrities: July 17, 1965 – Santiago Segura, Spanish actor, director, producer, and screenwriter; August 6, 1964 – Moosie Drier, American actor and director; April 15, 1984 – Ben Kasica, American guitarist and producer (Skillet).